Sign up and receive Property Email Alerts of Houses for sale in Avalon Estate, Durbanville. 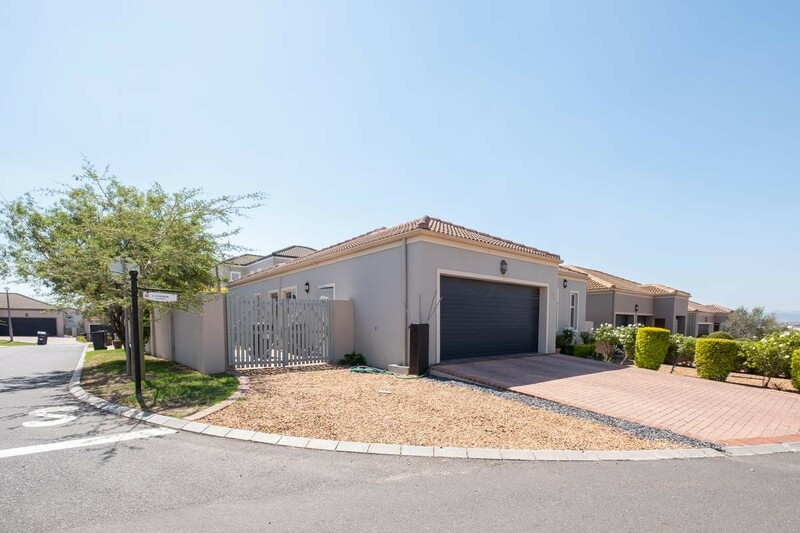 This neat single level home in the pristine Avalon Estate offers 3 bedrooms with 2 bathrooms, an open plan lounge, dining and kitchen with a scullery plus an open plan braai room. This is a dual purpose braai which can also serve as a fireplace in winter. The lounge and main bedroom boasts aircon units plus a fair size back yard with a beautiful lemon and pomegranate trees included plus additional parking space behind gates next to the house, ideal for a trailer, boat or additional vehicle. Furthermore this property is a corner unit, within close range to the main security gate but also within walking distance from the lifestyle centre. Avalon Estate is a lifestyle estate with excellent security and breathtaking landscaped gardens that compliments the water features and cobble roads throughout. The modern Lifestyle Centre with no less than 2 swimming pools, a tennis court, modern gym and squash court, beautician, tan can, property sales office and a function venue is unique in the area. A creche for 2 to 5 year olds is another bonus, within a safe environment. Sign-up and receive Property Email Alerts of Houses for sale in Avalon Estate, Durbanville.